From the strikingly handsome Omar Sharif to the legendary diva Umm Kulthum, Arab Film Distribution is proud to offer an unparalleled look at the giants of the Egyptian screen. Representing one of the world's oldest and most prolific film industries, this unique retrospective features previously unavailable titles steeped in the vibrant literary and musical traditions of the Arab World. Film lovers will delight in these fully remastered productions from the golden years of the "Hollywood on the Nile." 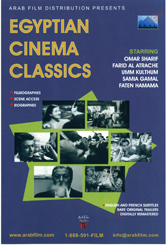 Egyptian Cinema Classics are also available individually.